We offer a variety of excellent dining options where residents can share meals with family and friends, including a state-of-the-art kitchen, dining room, and cafe/delicatessen. 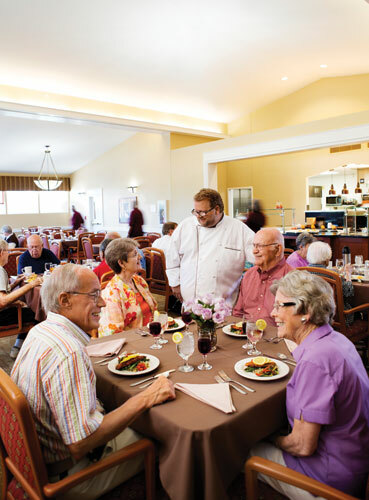 Residents enjoy the delicious meals prepared by our Chef and the cheerful atmosphere of our community dining room. Our move to The Sarah Community began a wonderful new chapter in our life. So many things are available to us - events and activities, conversation and dinners with friends, and, when we want it, quiet time. 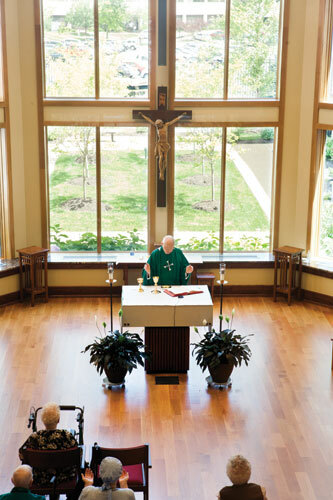 Mass is offered daily in our chapel, which has seating for 200 and large windows highlighting an outdoor nature area. Ecumenical services are also offered. Men and women of all faiths are welcome here to enjoy a peaceful, purposeful retirement. Our beautiful Marian Chapel is at the physical and spiritual center of our community and connects us all.